Sometimes you want to lock your door from the inside to stop anyone entering, even if they have a key. Think hotel rooms, B&Bs and Airbnb rentals. 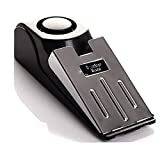 The solution is door stopper security products that wedge the door closed from the inside, some even have alarms on too.Most security door stoppers are small and portable so you can carry a travel bag, and very easy to install. 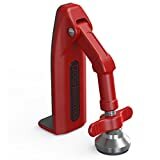 In this list of the best door stopper security products, you’ll find portable tools and sturdy rods that are perfect for sliding doors. Durable door stops prevent thieves from entering most rooms or a least slow them down. If you are looking for a well-designed heavy-duty door jam, Buddybar Door Jammer may be just what you need. It is made of 16 gauge powder coated steel and weighs just over 8 pounds and does not have any plastic parts. In addition, its floor mat is 8 square inches – larger than most strip door seals. This oversized floor mat helps securely hold the rod in place and provides greater resistance to external forces. The Buddybar extends from 36 inches to 51 inches and can be used in a variety of floor types including wood, carpet, and tile. Due to its weight, Buddybar is not ideal for travel, but it is an excellent access control for residential or dormitory use. How much do you plan to spend on the best door jammer? This is a high-quality door bar that is perfect for its price. It is made of the highest quality materials and has no plastic parts. In addition, it can be easily adjusted to suit different doors. The Doorjammer portable safety device is compact, lightweight and extremely durable, making it the ideal solution for keeping your door safe when you are staying at a hotel or friend’s home on the go. 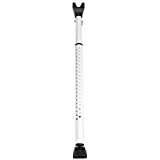 Easy to transport and install, this is a door jammer that is perfect for travel but can also be easily worked at home. What makes it so easy to use, it slides under your door, it just unlocks itself when you pull it up. If someone tries to push the door in with a horizontal force, the force is converted into a vertical force and the door occluder can be secured more safely. 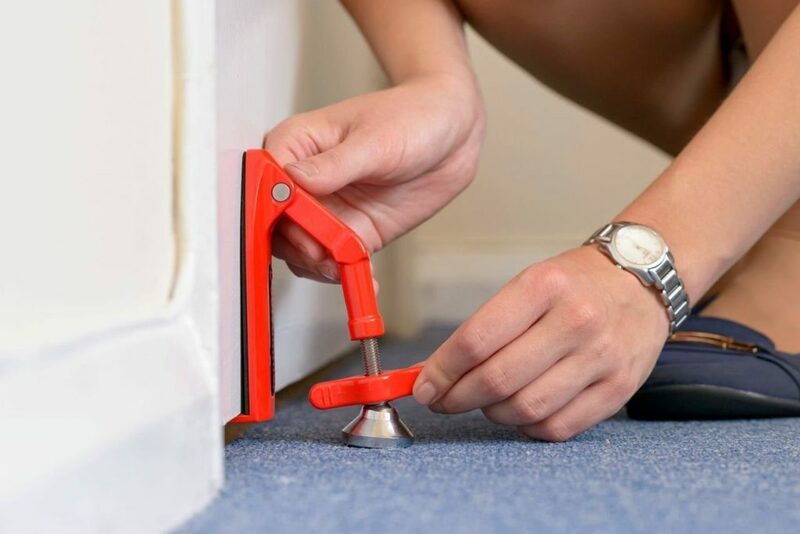 The main advantage of this tool is that it requires less than a quarter of an inch between the bottom of the door and the ground, which is what most interior doors have, most of which are lacking. This door stopper security product also has a sensitive 120 dB alarm. This alert will prevent the door from opening. You can carry this doorstop alert with you when you travel. You just need to put it behind the door. The precise wedge design prevents the door from opening when the door is trying to open. It will trigger a 120 dB alert. Intruders will be afraid of this noise and you will receive an alert. There is an adjustable sensitivity switch that prevents tampering. There is an on/off switch that will not cause this alarm to start sounding unexpectedly. You need a 9-volt battery that is not included. You must purchase it separately. This doorstop alarm is the 10 best door stop alarms. One complaint with this door stop alarm is that the precise wedge lacks sufficient weight and friction. This allows the wedge to be placed precisely on some type of floor it is worn on. The first few times, I used Wedge-it, and I heard that both steel and wooden frames are a bit sloppy because the closures and spring-loaded hinges try to do their thing. After using Wedge-It for about a month or two, I observed some of the nicks in the two units I owned, mainly on the concrete pavement, but without hair cracks or cracks. Wedge-It can and does leave some dents in the metal frame and can damage the wood, but it is usually the smallest and not visible and seems to have not been noticed so far. But you have been warned. 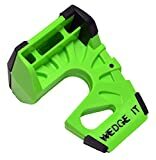 Wedge-It is everything I want it to work for my specific application. Despite this, I recommend that potential users consider my accidents, and it is very accidental that Wedge-It is more time-consuming than the materials used to make doors, frames, and hinges. For example, inexpensive hollow doors are fitted with lightweight hardware (hinge and screws) and a rugged mechanical hydraulic door closer. Have you ever eaten lobster or Alaskan crab legs? Tightening cracks? This is because the hinge failure caused by obstacles sounds like. Overall, I give this product a passionate five-star rating. It saves me time, hits the door, wipes the door with a cart and a trash can, and the bright colors not only make the unit easy to see but also hard to forget. Like any good tool, I have to go back to my steps and find a forgotten Wedge-It, but all I have to do is look for a clear opening. Oh, yes, bright colors can also appear when using white and brown paper towels. When Wedge-It falls into the trash bag, some digging must be done to recover the lost items. The Master lock (265DCCSEN) security bar will ensure that your spouse, family and other residents are safe at home. It is best suited for sliding or hinged doors and is suitable for indoor use. The simple rod is very strong and will not deform, weaken or rupture even after a heavy blow, impact or impact. Despite its sturdy steel construction, it is lightweight and improves handling and reliability. It takes a short time to install it on the door, and you don’t need special tools or skills. Just follow the manufacturer’s instructions. To accommodate different door sizes, the length is adjusted from 27.5 inches to a maximum of 42 inches. So if you decide to use it on a different door, you don’t need to buy other items, cut or modify the bar. It has a padded foot to prevent movement or sliding and to protect the floor surface.